It is possible to make a tour to Mt. Kailash and Lake Manasarovar combining with the highlighted places of central Tibet. Generally, our tour covers Lhasa, Gyantse, Shigatse and Sakya then eventually it merges with the major route (Kathmandu-Kailash) in Saga (small Tibetan town) the continue follow the same route for the entire journey. Our tour to Mt. Kailash and Lake Manasarovar from Lhasa requires at least 17 days. However, depending on the time frame and places we would like to cover in the tour, the tour can go longer or even shorter too. Lhasa to Mt. Kailash and Lake Manasarovar tour commences from Kathmandu with an hour & 10 minutes Trans-Himalayan flight to Gonggar airport (Tibet). Our Tibetan guide meets you at the airport and escorts you to the main city (Lhasa) which is 98 km away from the airport. In Lhasa, we make two days guided sightseeing tour for two days that covers almost all the highlighted places situated inside Lhasa. After that we start our journey to Mt. Kailash and lake Manasarovar via Gynatse, Shigatse and Sakya Monastery. As usual, “Lhasa to Mt. 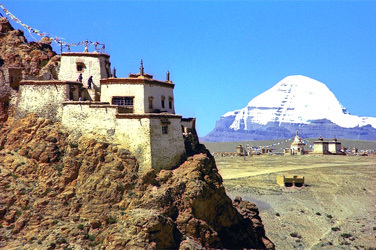 Kailash Tour” consists of a 3 days circumambulation around holy Mt. Kailash. The tour ends at Kerong. Day 01 FLIGHT KATHMANDU - LHASA, transfer to the airport for the flight from Kathmandu to Lhasa on Air China. This one hour trans Himalayan Flight will give you an opportunity to have an aerial view of the Mt. Everest and other Himalayan Peaks (weather permitting). Arrival at Gonggar airport around 13.30 hrs. local time. After clearing immigration and customs it will be a two hour drive to cover the 93 km. to Lhasa which is situated at an altitude of 3650 meters (13,000ft). Upon arrival we check in at the hotel, right in the heart of the old city. Day 02/03 SIGHTSEEING, during these three days in Lhasa we visit the Potala palace, Drepung and Sera monasteries, the Norbulinka and of course the famous Jokhang temple including the surrounding Barkhor. Day 05 GYANTSE - SHIGATSE, (3800 m.) this will be a busy day. In the morning visit Gyantse stupa and monastery followed by a two hour drive to Shigatse. Here see the giant Buddha in the famous Tashilumpo monastery. The seat of the Panchen Lama. Day 06 SHIGATSE - LHATSE or Tingri, (4350 m. / 4000m. *) the journey today brings you over two high passes with fine views. For lunch we stop in the small town of Lhatse. Depending on how much time we spend during the morning in Shigatse we will stay overnight in Lhatse or Tingri. Here you will meet your Nepali staff for your onward journey. Day 07 Saga (4450m) On the first long driving day over the sandy and rocky land of Tibet, other things like lake, nomads chasing thousands of yaks and sheep keep you busy. By the late afternoon you will cross Bhramha Purtra River way to typical Chinese and Tibetan town, Saga for night. Day 08: Drive along the Tibetan highlands Paryang (4750m). Day 09: Drive westard to Lake Manasarovar & continue to Chui Gompa (4560m) on the shores of the holy Lake. Day 10: AM: Puja and holy dip in Lake Mansarovar. Rest of the morning free to visit Chui Gompa, explore the shores of the lake or visit hot spring. PM: Drive to Darchen (4560m). Day 11: Day in Darchen. Drive to Serlung Monastery and optional trek to Asthapath for a close-up view of Mt. Kailash. Overnight at Darchen. Day 12: Drive approx 13 Kms from Darchen to Tarboche, the trek starting point of Kailash Parikarma. Trek to Dira Puk (4775m). Day 13: Continue trek over Dolma La Pass (5650m) to Zuthul Puk cave temple (4700m). Day 14: The Kailash trek ends today near Darchen. Drive to Paryang (4750m). Day 15: Drive to Saga (4600m).